Облик медведя теперь дает 120% бонус к броне на всех уровнях, чтобы сделать процесс танкования друидом низкоуровневых подземелий проще. Ранее бонус брони составлял 65% для персонажей ниже 40 уровня. People keep calling it "beer form" for some reason. -Suggested set was the set from the alliance instance(http://wowhead.com/?itemset=161#comments) Was suggested for lower levels who intend to use this form, I personally have not nabbed any of it, mainly because I'd crap myself trying to get to the instance... Any suggestions on other specific items for feral? In patch 2.3, druids will now be able to shift into their other forms without having to shift into human form. For example you can shift from bear form immediately into travel form. Druids in Облик кошки, Облик медведя, Походный облик or Походный облик, are treated as Beasts, and thus are susceptible to Hunters' . Also, they will not show up on Выслеживание гуманоидов but will show up on Выслеживание животных. Druids in Воплощение: древо жизни are treated as Elementals and thus are susceptible to Изгнание and . EDIT: For patch accuracy. Thanks for the responses. Druids in Cat, Bear, Dire Bear, Travel or Aquatic form, due to not being humanoid anymore, cannot be sapped. Also a noteworthy is that in feral form, a skinning knife is not required to skin an animal. It is a Realy Good PvP form, But they can't use pots and that is sad. Legs with 200 armor, Bear Form increases the amount 180% (+10% if you got Thick Hide). With Thick Hide): 200 * 1.9 = 380 Armor. Without Thick Hide): 200 * 1.8 = 360 Armor. but who will pvp in tree form? Cute little bear or a druid? The druid bear/cat forms are getting a new "skin" in patch 3.2. Blizzard already released a picture of the new bear form skins here and here. 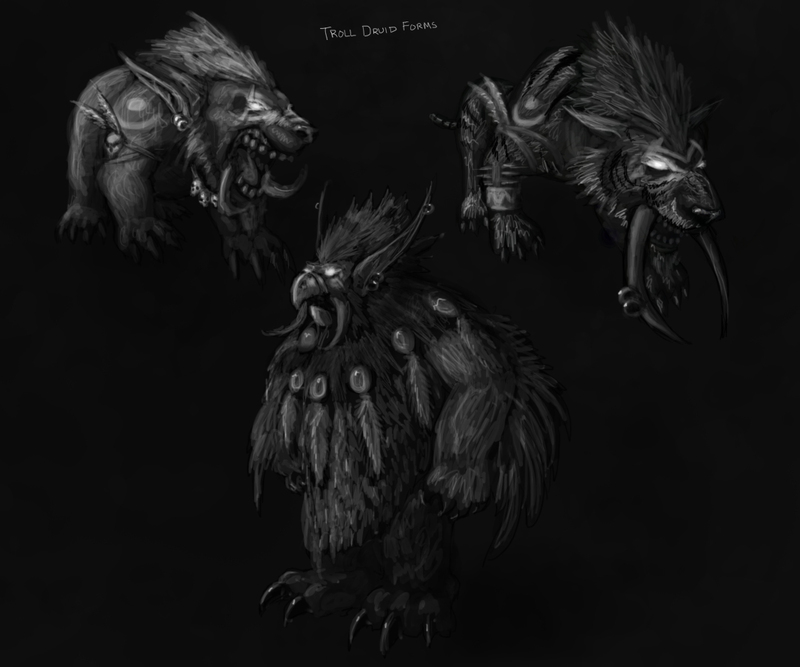 In patch 3.2, the appearance of druid bear and cat forms will be redesigned, with five different color schemes to chose from, based on the druid's hair (night elf) or skin (tauren) color. holy shi- those are awsome! so in cata the quest for this form will be moved to level 15 and cat form will be moved to level 8. my question is will i need to redo the quest on my druid that is over level 15 (currently at level 24) or will we not lose it. Dire bear form no longer exists in Cata. Now Bear form scales with level. Worgen and Troll feral forms. The link added by Reapper almost a year ago it's pretty accurate. Causes agility to increase attack power. What? So cat form no longer causes agility to increase attack power or this is just a buff for bear form? IT IS JUST MY OPINION, if you don't like it don't READ IT, it's easy! Bare druid is B 4 tank, they doesn't have guns in HED though lol! Is "Bear Tanking" history, or is Blizzard going to save it in 4.3? Despite of this being the form to tank with, in BC and WotLK content this is the form to go if you want to level fast as feral. Altho Catform is the DPS form, it takes a while for it's damage to build up - while the health the mobs have favor burst over dots. Therefor, you can 2-3 shot mobs in Bearform, while you take around twice or thrice the amount of time to kill em in Catform. Not to mention the ability to pull groups of 10-15 and AoEing them down thanks to Savage Defense. As of 4.3 the stamina increase has been buffed to 20%. OK, Sum durids is bare. Tehm whos bare durids, can B 4 tank. The stamina increase has been boosted from 20% to a whopping 40% in patch 5.4 ptr, let's hope that it sticks. It's getting nerfed in WoD down to 180% stamina :( There's a druid perk raising the stamina 10% more though, but the armor won't be increased. The perk for this is ... I just hope Blizzard releases a glyph to make this better as it used to be. What are they doing to bears? They say they plan for bears to be "high health; high armor" tanks. and now bear forms losing 50% armor bonus :l..
Is there anywhere that a person can view all the various models and colors of bears in the model viewer? The devs told us exactly how 7.0 Bear Form rage generation works at the links below. Q: What is the base rage gain per white attack in Bear Form? 7.875 for level 20 and up (It’s higher before that, but I doubt you care). It’s 1.75 baseline, * 2.5 attack speed, * 1.8 bear form multiplier. Am I missing something? As a balance Druid, when I shift into Bear Form, I have no Bear abilities. Am I just supposed to stand there? I can't even auto attack.. where is Mangle, Thrash etc? Вы принимаете облик медведя. Ваша броня усиливается на 220%, а выносливость повышается на 25%. В этом облике вы невосприимчивы к эффектам превращения и создаете повышенную угрозу.